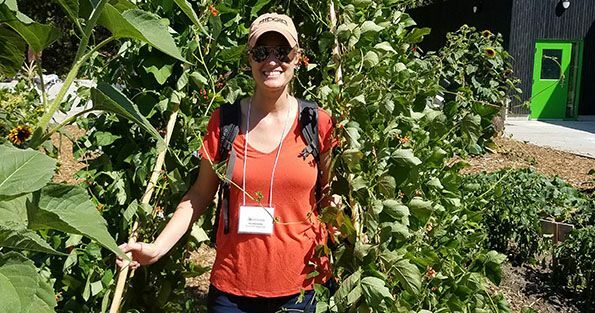 Pictured: Joy Casnovsky at Rainier Beach Urban Farm and Wetlands in Seattle, during the NSAC summer meeting. Last week, our Deputy Director, Joy Casnovsky, attended the National Sustainable Agriculture Coalition’s (NSAC) Summer Meeting in Seattle, WA to discuss the 2018 Farm Bill priorities and strategy. NSAC is an alliance of grassroots organizations (of which SFC is a member) that advocates for federal policy reform to advance the sustainability of agriculture, food systems, natural resources and rural communities. Congress passes a Farm Bill roughly every five years that funds everything from soup to nuts: conservation programs for working lands, commodity payments, seed research, SNAP, farm loans, direct marketing and local food system support (and a lot, lot more). The US House and the US Senate have both passed their versions of a Farm Bill earlier this summer. Next stop on the Farm Bill train? Conference Committee. (For a refresher on how a bill comes to be, School House Rock “I’m just a Bill” is a classic.) Members of Congress from both chambers and both parties have been appointed to the Farm Bill Conference Committee. Their goal is to pass a farm bill before the 2014 Farm Bill expires September 30, 2018. Why the rush? Unless programs received mandatory, baseline funding in the last Farm Bill, only programs that are funded will continue on October 1, 2018. Not passing a farm bill on time could be detrimental to the “Tiny but Mighty” programs that organizations like Sustainable Food Center and others who work within the local food system sphere have used to spearhead initiatives and projects. For example, SFC received a Farmers Market Promotion Grant in 2011 that launched SFC Double Dollars. This year, sales from SNAP, WIC, WIC FMNP and SFC Double Dollars accounted for more than $204K across SFC Farmers’ Markets and partner markets and mobile markets. That represents a quarter of a million dollars spent on locally produced and raised products from Central Texas farmers, ranchers and food businesses. Let’s keep it very simple: The Senate version is a bipartisan bill that supports local food systems and hungry families. For example, the Senate version includes LAMP, which includes the aforementioned Farmers Market Promotion Program, paired with the Local Food Promotion Program and the Value-Added Producer Grants Program at a mandatory $60M funding level each year of the farm bill. The Senate version made very few tweaks to SNAP. The House version narrowly passed and does not support local food systems and hungry families. There is a very strong chance that the farm bill conference committee that is now negotiating the differences between the two bills will not include the excellent new LAMP program. That would be a blow to the local food community. We would lose the mandatory funding that we have depended on for years; we would need to fight for funding every year through the annual appropriations process. Additionally, The House version cut SNAP by $23 billion. Time is not on our side. Congress is currently on recess and then will have about one month to pull together a bill. Politically, there are many unknowns given that mid-term elections are around the corner, and may affect the make-up of Congress. For now, we will focus on rallying support for a 2018 Farm Bill that promotes local food systems, is fair to family farms and treats hungry families with dignity. Stay tuned for more as this Farm Bill season plays out!